Brussels Sprouts Tacos with Caramelized Shallot Salsa. Okay. Can we really call these tacos? I’m bringing my disturbance of the Brussels sprouts peace right into 2014. Destroying the sanctity of the sprout… one taco at a time. I might have been wearing a way-too-potent face mask as I was cooking these up because I actually… really loved them. Like really. And I totally did have on a face mask for the first half of cooking, which doesn’t bode so well when your face is hanging out over high heat. cheese, in every form possible. on toast, with pretzels, dipped in jam. Yeah. cereal, and by cereal I mean leftover chex from the homemade chex mix I made. Not a fan. chili that I discovered in the freezer, which may or may not have been from 2012.
store-bought general tsos chicken. microwavable rice. gummy bears. err, technically gummy vitamins. leftover holiday harry & david pears, drenched in honey. the stalest leftover Christmas cookies in all the land. instant strawberries and cream oatmeal. but I told you that last week. Needless to say, I’m a teensy bit giddy. I’m my stereotypical world, I think today REALLY starts 2014. Can I just hashtag my entire life #illstartonmonday? Everyone goes back to work, you resolve to unsubscribe from faux facebook friends (um, can instagram please install this feature?) and you’re determined to keep a cleaner fridge. Maybe that’s just me. Because it often looks like a bomb went off. Anyhoo, If I don’t see a plastic container of food for a few weeks, I’ll be thrilled. The idea of sprouts tacos has been floating in my brain for months, which should come as no surprise considering I find a new way to trash them up weekly. But a few days ago I asked you on facebook & twitter if you thought it might be a good idea… and… and… you sorta did. Okay. Well some of you probably thought I’d lost my marbles and others cannot think of a worse combination on the planet. But the majority was overwhelmingly ok! with the idea. So. I shoved sprouts between a warm tortilla. I don’t know if I’m ever going back. I knew all along that I didn’t want to use the Brussels as a shredded topping, like all cabbage-y and what not. I want them IN the tacos, to be the base. A Brussels taco, with other stuff on top. Sweet and spicy and smoky. Lots of my favorite things. The sprouts inside the taco are shredded and cooked in a bit of olive oil with garlic and smoked paprika. I like to do it over high heat so the sprouts crisp up a bit. Not straight up fried, but a bit crunchy nonetheless. First layer goes in the tortilla, covered in a fluffy little blanket of grated manchego cheese. I could probably stop there and be happy. Of course I did not though. Nothing is ever enough. Before starting the sprouts, I began caramelizing a few shallots and roasting grape tomatoes. Combined with some salt, pepper and cilantro (if you dig it), it’s the coolest little salsa this side of the (my?) internet. I’m eating the leftovers on everything. Eggs! Chicken! Fish! Toast! Chips! Salad! See? I told my husband that I’d have a little snack for him – knowing that this could never constitute a full meal, ugh – and that I was putting Brussels sprouts in tortillas and doing sacrilegious things to the term “taco.” He said he was down (after questioning what kind of meat would be included) and surprisingly, ate them right along with me. I couldn’t believe it. Like, scarfed.them.down. But we both did, so I can’t blame him. It may be deceiving, but this meal is light. It doesn’t feel heavy when eating – in fact, I myself wanted a side or two. Any sort of chips with guac or maybe a bean salad would be perfect. Heat a skillet over low heat and add 1 tablespoon of olive oil and butter. Add the shallots with 1/4 teaspoon salt and stir to coat. Cook the shallots, stirring every few minutes, until the slightly golden and caramely, about 15 minutes. Stir in the brown sugar and cook for another 10 minutes. If at any time, the shallots seem to be burning or crisping up, reduce the heat. While the shallots are caramelizing, toss the tomatoes with the remaining tablespoon of olive oil, 1/4 teaspoon of salt and pepper. Stick them in the oven and roast for 15 to 20 minutes, until they just begin to burst. 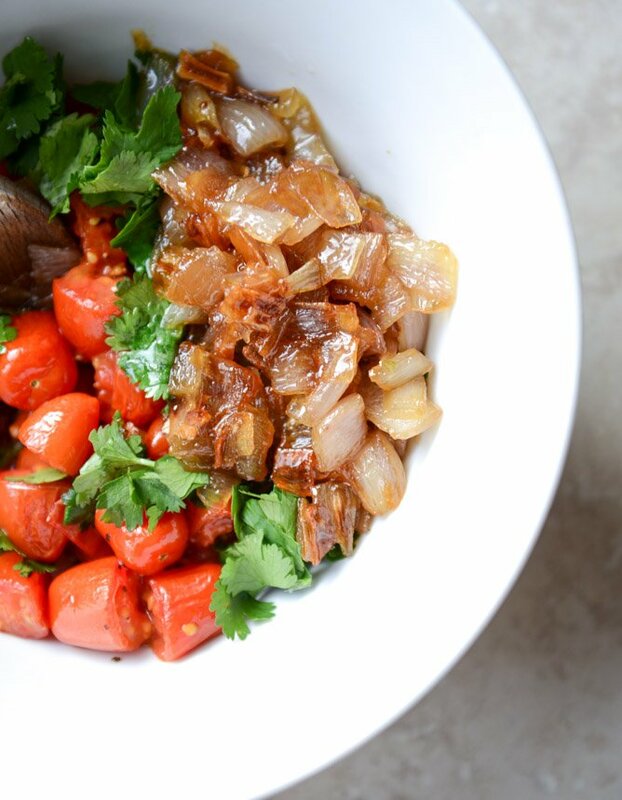 Combine the tomatoes, shallots and cilantro in a bowl. Mix and mash it together with a fork. Taste and season additionally with salt and pepper if needed. While the shallots and tomatoes are cooking, heat a large skillet over medium-high heat and add the olive oil. Add the brussels with the salt and pepper, tossing to coat. Cook until slightly soft and the sprouts begin to crisp, about 10 minutes, stirring occasionally and flipping the sprouts. Stir in the smoked paprika, garlic and red pepper flakes and cook for 30 seconds. Turn off the heat. To serve the tacos, warm the tortillas and fill them with the brussels sprouts. Add some grated manchego on top and a few spoonfuls of the salsa. Serve! Annnd I’m done. If you like the sprout of the Brussels, these win. These look so yummy! Love that you made the sprouts cripsy kind of reminds me of the little corn chips you always get on a taco salad nomnomnom! These tacos sound so good! This sounds crazy good! I’m on a brussels sprout kick lately and I simply can’t get enough of them. I would have never thought to put them in a taco but this is genius! Way to go lady! I made these for dinner tonight and they were a HUGE hit with my husband (and me!). We’ll be making them again and again- thanks for the delicious recipe!! this is great! I’m demi-vegetarian. I made these tacos two nights ago and thoroughly enjoyed them! I liked the smoky and a little bit spicy flavor of the brussels and then the delicious roasted tomatoes. Topping the tacos with manchego (this was my first time having it) also added to the unique flavors of this dish. I used La Tortilla Factory Mini Fiesta Wraps to give it even more pizazz. The leftovers for lunch the next day were still delicious and everyone was commenting on what an interesting combination it was. Thanks for sharing a great recipe – I will definitely be making these again! Package the salsa and sell it before I do. That sweet, shallot masterpiece is worth millions. OMG my meat eating hubby loved these! Didn’t miss the meat at all. Will definitely make these again. A great meatless yet flavorful meal that left us satisfied. These were great! No cheese in ours and added avocado slices and jalapeno diced bits. So good! What an ingenious combo…we loved! Thanks!